← Now that’s a candy bowl! Have I mentioned that Neopolitan wafer cookies are a guilty pleasure of mine? Those crunchy thin cookies with creamy filling between wafers which resemble communion wafers more than any cookie should. 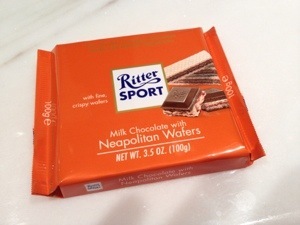 Ritter Sport’s Neopolitan wafer bar has the wafer sandwiched inside milk chocolate. It’s a good candy bar with a European chocolate flavor, meaning that it tastes a little of hazelnuts. Posted in crunchy, Milk chocolate. Bookmark the permalink. Is Ritter your favorite wafer cookie? I have always been a fan of wafer cookies in general, but never thought to distinguish among brands. Often I buy the cheap stuff–maybe I should upgrade? 🙂 Let me know what kinds you like best. Ritter only makes the chocolate bar, I should have a taste test of the wafer cookies since I usually buy the cheap ones, too. Do you have a favorite? thanks for giving me the taste test idea. lol–funny that I gave a candy expert a taste-test idea. 🙂 I never even look at brands. Often they’re a dollar store purchase 0-: Wonder who even makes them? And store brands, etc can be regional. I love the texture contrast of the crispy fall-apart wafer and overly-sweet thin spread of hydrogenated filling. And if moderation is used (ha), they can be low-cal. Anxiously awaiting your (yummy) results!